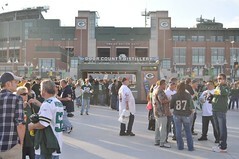 One of the most revered stadiums in the country, Lambeau Field is a year-round destination venue enjoyed by Packers fans in a variety of ways. 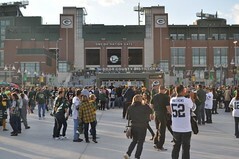 Featuring the only true “retro” look in the entire league, Lambeau Field remains a Packers cultural center, enjoyed throughout the year. 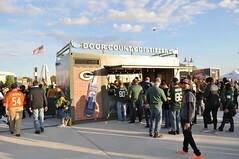 As their food service provider, Delaware North was looking for an innovative way to add an additional bar, outside of the stadium. 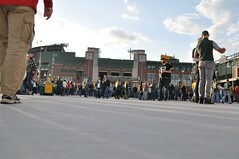 But, here’s the catch- it couldn’t stay in their parking lot permanently. 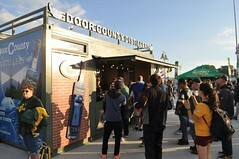 Instead, they needed a mobile solution that could be moved in and out of storage during the off-season. 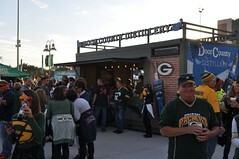 Designed to reflect the current aesthetic including color and materials, Lambeau’s shipping container bar consisted of a purpose-built structure with four flip-up awnings. 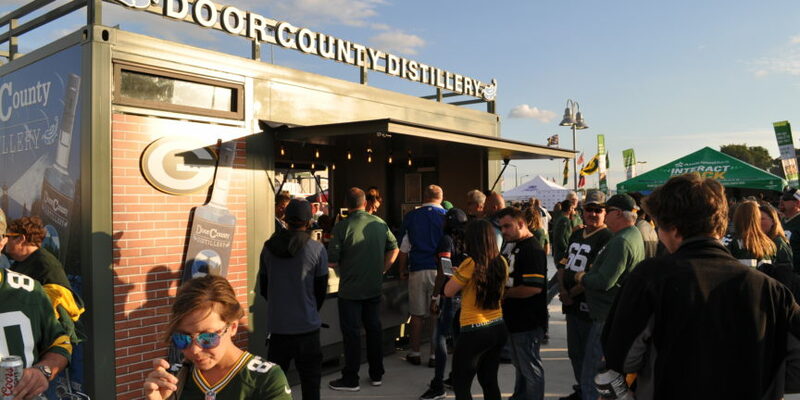 Delaware North chose a smooth sided unit, perfect for vinyl graphics, but decided to include a small section for corrugated metal, a nod to the typical shipping container aesthetic. 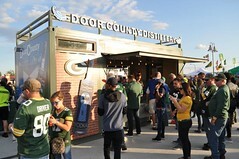 Inside the unit, we included a speed rail, aluminum counters, plenty of storage, and an ice chest for easy-access to frosty cold beverages. 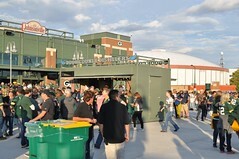 We couldn’t wait for this project’s debut at the Packers VS Bears game in September. 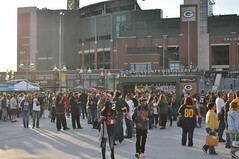 As the sun set behind Lambeau field, the plaza buzzed with excited fans. 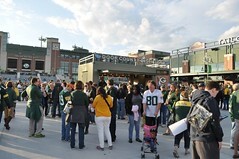 As they passed, a few stopped to marvel at the stadium and a few stopped in for a last-minute drink before walking in. We are unbelievably grateful to Delaware North for giving us this opportunity, and we look forward to following their journey in the years to come!